I am assuming you all know who peppa pig is? If not, can I come stay with you for a while?! I am sure we have all heard and watched Peppa Pig. D started to enjoy Peppa Pig a month or two ago, Since then everything has been Peppa Pig! At the start of this month we found a Peppa Pig book while out doing our shopping. 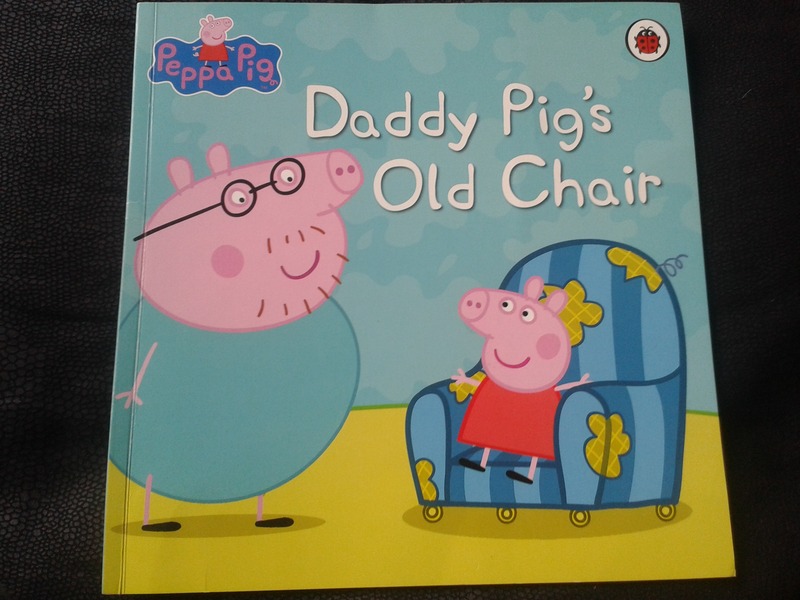 I must say it was an instant hit with D. Daddy pig's old chair is a story about the school roof needing fixed which they raise the money to fix it by having a jumble sale. 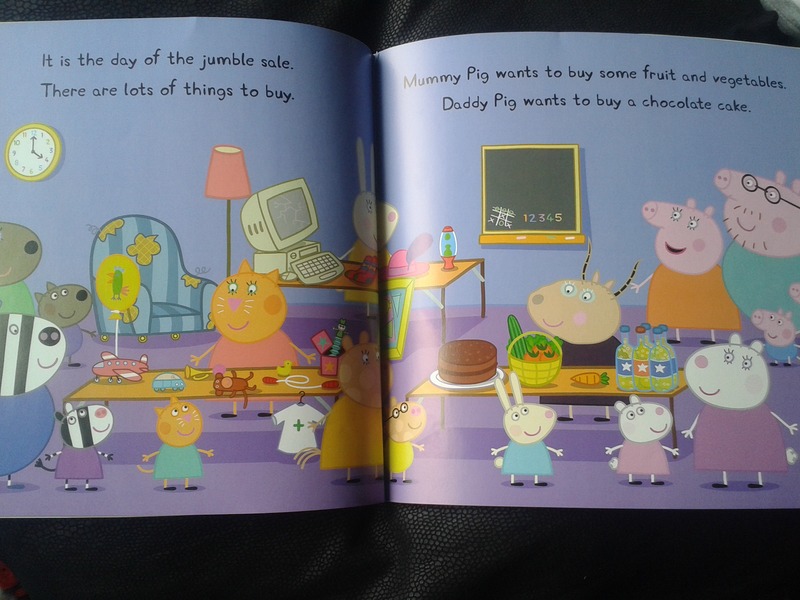 Everyone brings something to sell and daddy pigs old chair was given by mummy pig. Which he buys back for lots of money! We have managed to read Daddy pig's old chair every 2 days! I can recite each page without looking now. 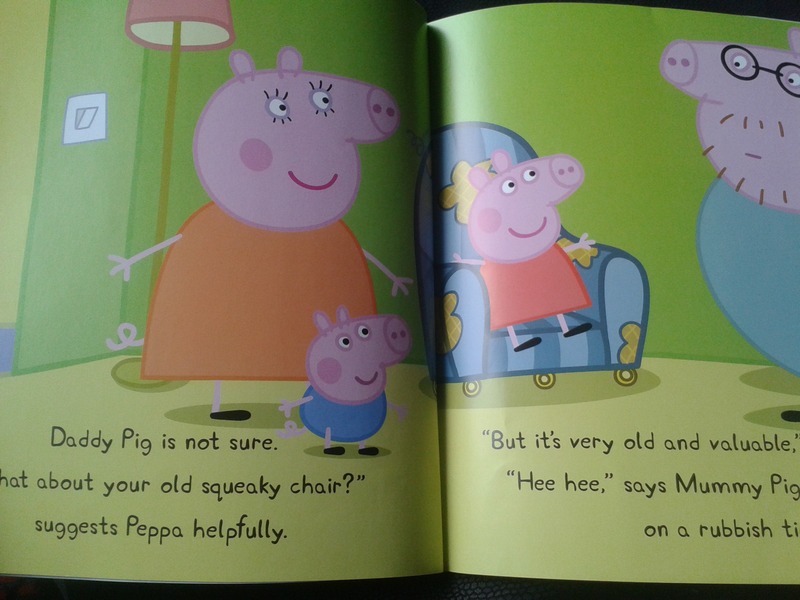 As can be expected with Peppa Pig, there is a very appropriate amount of reading per page. There are usually 2 sentences per page. What I didn't expect was for D to notice the small everyday objects throughout the book. I hadn't even noticed at first! The illustrations in the book are simple but very accurate. Each page has something you can find that isn't talked about in the story. Everyday objects or objects we would expect to find in the setting on that page! D loves to find these on each page. He first found the light switch on the first day we had the book. He regularly points to it and says 'light!' D also loves to pretend to turn the light on with it! We both have the same favourite page. 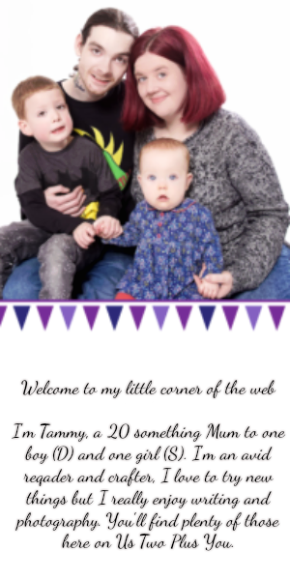 The jumble sale page. It's full of lots of items and people. You can ask D to find any object or person on this page if given a good amount of time he can find it! I love doing this with D, he gets so proud of himself for finding them! All in all I would say this has to be our most favourite book. D has learnt so much from this book and is recognising items around our house and when we are out that he finds in the book. D also likes to follow the words in the book while I read and will find the objects I am reading about when I say them reading the story! 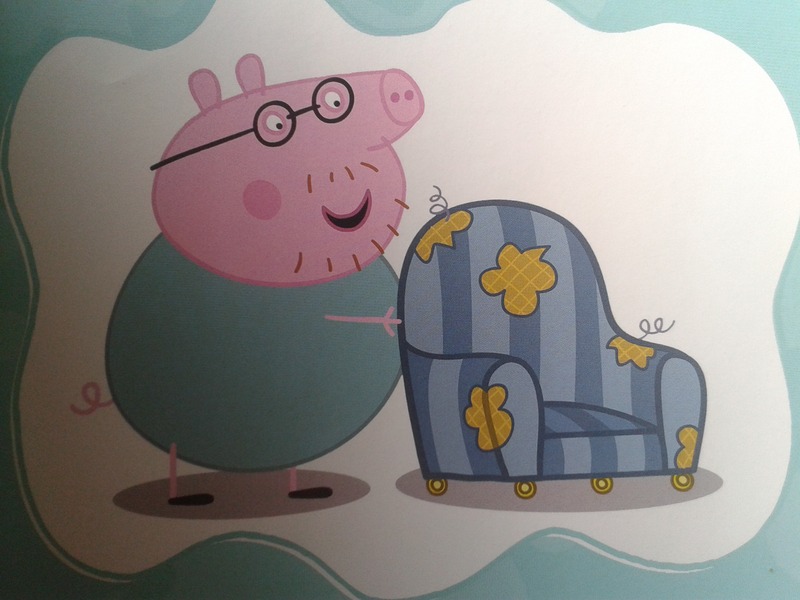 I would definitely recommend Daddy pig's old chair for teaching and learning about awareness of the world and everyday items. Daddy pigs old chair retails for £4.79 and is available on Amazon.